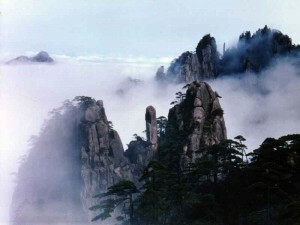 Since ancient times, Huangshan (黄山 in Chinese or the Yellow Mountain) has been one of the most famous mountains in China. Odd-shaped pines, spectacular rocky peaks, seas of clouds and hot springs are known as the “Four Natural Wonders” of The Yellow Mountain Mountain. Huangshan is a must-visit place for both domestic and foreign travelers. 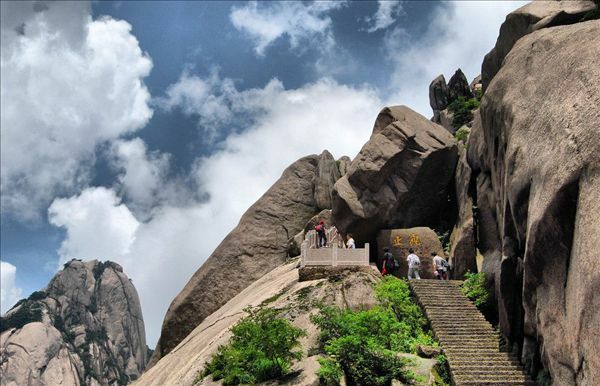 This one day Huangshan group tour will take you to visit the mountain in a shared coach, with English speaking guide to accompany you to hike the mountain all the way. 6:30am -7:30am Our English speaking tour guide will pick you up from the lobby of Huangshan International Hotel 黄山国际大店(Add: No.31 Huashan Road Tunxi District, Huangshan City. Chinese Add: 黄山屯溪区华山路31号). 8:30am-09:00am First take you to the Huangshan Scenic Area transfer center, where you will take the shuttle bus owned by the Huangshan Snecia area to the Yungu Cable Car Station（云谷缆车）. Take the Yungu Cable Car up (excluded CNY80 per person). 09:30am-14:30pm Visit: the White Goose Peak (白鹅峰), the Beginning-to-Believe Peak (始信峰), Black Tiger Pine (黑虎松), etc. Have lunch on top of the mountain (excluded). Visit The Lion Peak（狮子峰）, A Monkey Gaping at the Sea (猴子观海), The Flower Grown out of a Writing Brush Rock (梦笔生花), etc. 16:00pm-1700pm Take you back to Huangshan city. End of your tour. Please send us your full name, hotel, travel date and your mobile when make the booking. Our English-speaking tour guide will call you or leave a message one day in advance to confirm the pick up time. This Huangshan group tour includes both Chinese travelers and foreign travelers. There is no shopping stops during the tour. Full prepayment by Credit card or PayPal is needed to guarantee the tour. Our licensed English speaking tour guide will accompany to hike on the mountain and give introductions about the Yellow Mountain including facts, stories and others.